We’ve been talking about cornerstone content a lot lately. Website owners use cornerstone content to answer the fundamental questions their newest prospects have. Cornerstone pages are informative, instructive, and they help your prospects understand the foundational information needed to interact with your business. Cornerstone content pages answer those cocktail party questions. You know the ones I mean, right? How does [your business] apply to me? Why did you get into [your business]? What motivates you? How can I get started with [your business]? What do I need to know to be smart about [your business]? In this post, we’re going to cover how to use cornerstone content on your site and invite you to join us for free cornerstone content education we’ll offer next month. You heard that right: free cornerstone content education! If you can’t wait to sign up for that, scroll to the bottom of this post and get your name on the list. We recommend you set up cornerstone content as a page on your site, not a post. There’s a good reason for this. You’ll want to grant cornerstone content pages “most-favored content” status. You don’t want them to get lost in the mists of time, which can happen with blog posts. Add them to your navigation menu. Link to them frequently in your regular content, like blog posts or podcast show notes. Cross-link between your cornerstone content pages. A Minimum Viable Website includes the main pages all sites need. It’s something to aim for if you are starting a new site — a way to beat the overwhelm of starting from scratch so you can get some basics in place and start building on them. Home page. This page confirms your visitors have arrived at the right place, tells them what you can do for them, and guides them toward what you’d like them to do next. Contact us page. This page should contain contact information and/or a form that allows site visitors to get in touch. Content page. Ideally, this is regularly updated content, like a blog. Google rewards fresh content by ranking it higher. If you’re just getting started, feature your cornerstone pages here. Once you’ve started a blog, leave your cornerstone pages in your menu, and link to them frequently. As you can see, cornerstone pages are considered part of the primary content you’ll feature on your site. Store/Products/Services/Donations. Most sites have a commerce element, whether they’re for-profit or nonprofit. Landing pages for your calls to action. You’ll use landing pages to encourage site visitors to take action — subscribe, vote, attend an event, or buy a product. We’re going to be doing something new at Copyblogger in 2016, and we’re pretty excited about it. Every so often next year, we’ll offer a free Copyblogger Content Challenge. These challenges are open to the public, and they’re free for everyone. We’ll let you know here on the blog when a new challenge is coming, and we’ll share news about them on social media using the hashtag #cbchallenge. 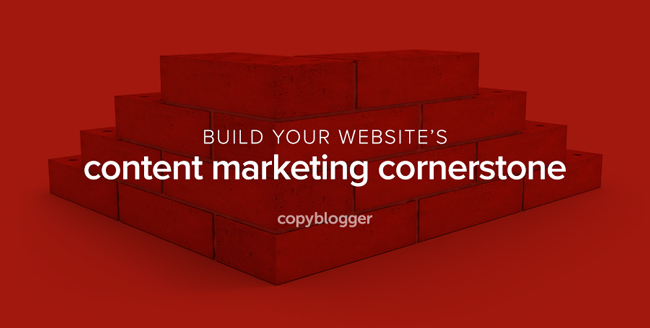 Each Copyblogger Content Challenge will have a theme, and January’s theme is going to be cornerstone content. When you join the content challenge that starts in January, you’ll get free education about creating useful, powerful cornerstone content for your website. You’ll be invited to participate in a private forum where you can ask questions about the content challenge and share links to content you’ve created. And you’ll be invited to attend a free webinar for everyone who’s participated in the challenge. Everyone who participates in the challenge will also receive an invite to join us inside Authority, our advanced content marketing training program, to continue their education. Authority is moving full steam ahead with our current members but is closed to new members at present. We’ll open our doors to new members for one short week in January. Everyone who’s currently on the interest list will be invited inside, and everyone who joins us for the January Copyblogger Content Challenge will be invited, too. We’d love to have you join us for our free Copyblogger Content Challenge this January. You’ll learn how to create cornerstone content pages that boost your authority and help build a solid relationship with your prospects. A private forum where you can ask questions about the content challenge and share links to content you’ve created. Everyone who participates in the challenge will also receive an invite to join us inside Authority, our advanced content marketing training program, to continue their content marketing education. The doors to Authority will open up for one week only. Discover how to create cornerstone content pages that boost your authority and help build a solid relationship with your prospects. Editor’s note: This Copyblogger Content Challenge ended on January 27, 2016.